Harold Anderson was enshrined in the Naismith Memorial Hall of Fame on July 1, 1985. He coached for 38 years and compiled an overall record of 604-259. Coach Anderson was one of the first coaches in basketball history to record 500 wins. He was a superstitious coach who would wear the same suit to each game when his team was winning. Harold was a star Ohio high school athlete at Central High School in Akron. While coaching high school from 1925 to 1934, his Toledo Waite teams won three city championships and had two state Final Four appearances. Anderson won 11 letters in four sports at Otterbein College in Ohio. He was All-State in 1923 and 24 and also MVP in 1924. 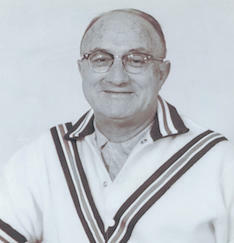 Anderson then took his considerable coaching talents to the University of Toledo (1934-42). At Toledo, Anderson compiled a 142-41 record and a third place finish in the 1942 NIT. Andy’s greatest accomplishments were achieved on the campus of Bowling Green State University from 1942 to 1963. He produced a 362-185 record that included six NIT tournament appearances and three trips to the NCAA Tournament. In the process, Anderson gained a solid national reputation for producing consistent teams that played hard, clean and fair basketball. While pioneering the run and gun, up-tempo style of play, Anderson developed a host of All-American athletes, the most prominent being Hall of FamerNate Thurmond. As an officer and President of the NABC, Anderson was instrumental in forging the East-West All-Star game to benefit the NABC.